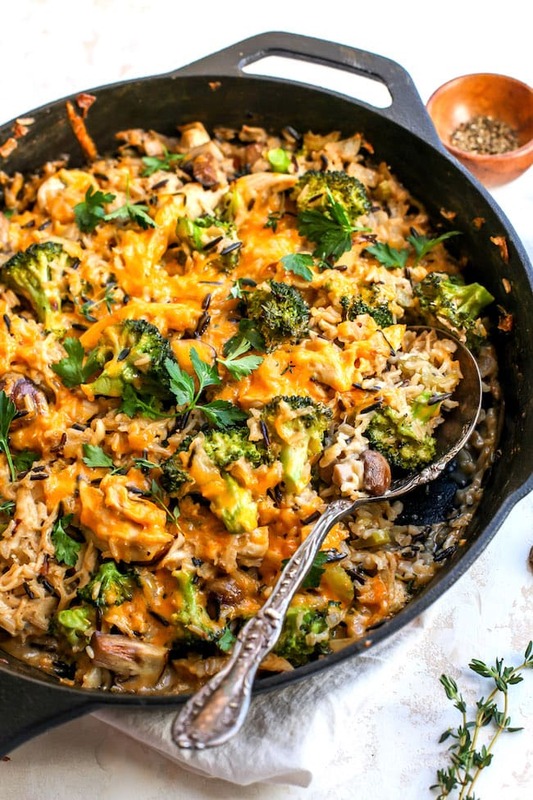 Cheesy Chicken Broccoli Rice Casserole is made in one skillet and the perfect comfort food! This classic casserole is always a weeknight dinner favorite! Everyone needs to have a chicken and rice casserole recipe in their regular dinner rotation. It is just one of those meals that always feels like home. This Cheesy Chicken Broccoli Rice Casserole is the recipe you want to make over and over again. It is classic comfort food, but made a little bit healthier. 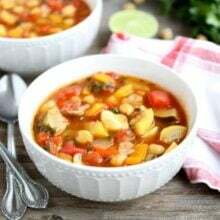 There are no canned soups and lots of veggies, but don’t worry, your kids won’t complain because the cheese will get them to take one bite and one bite is all it takes to make them realize the deliciousness! They will quickly fall in love with this casserole and clean their entire plate. 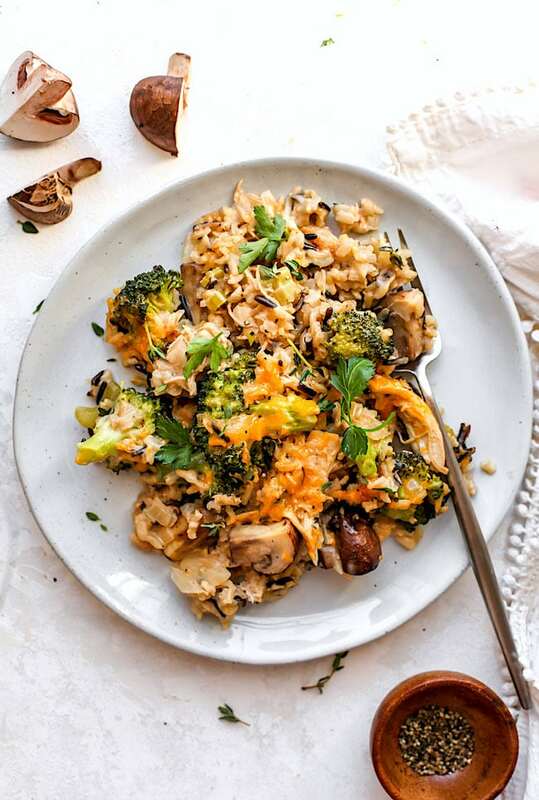 My boys love this chicken rice casserole so much, they don’t even notice the broccoli or mushrooms. When chicken broccoli rice casserole is on the dinner menu, I know it is going to be a good night! 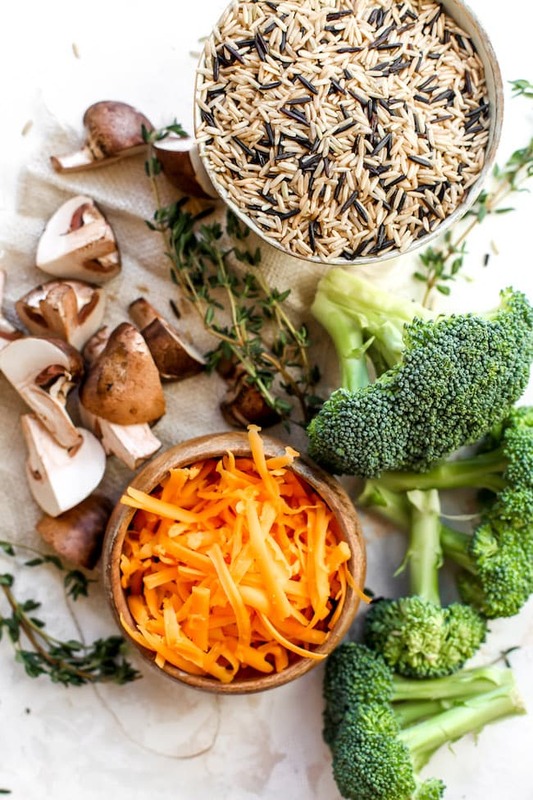 Rice-I use a wild rice blend, but you can use white rice or brown rice. Quinoa would also be good. Butter-If you prefer olive oil over butter, feel free to swap. Garlic-Fresh garlic is best, don’t use garlic powder. Onion-Use a yellow or white onion. Mushrooms-Use cremini mushrooms that are quartered. Celery-Dice the celery, the kids won’t even know it’s there! Dried Thyme-Don’t skip the thyme, it adds lots of flavor. Flour-If you need the casserole to be gluten-free, you can use all-purpose gluten-free flour. Dry White Wine-If you don’t want to use white wine, you can use all chicken broth. Chicken Broth-Use your favorite store bought chicken broth or you can use homemade chicken stock. Broccoli-Cut the broccoli into florets so you have bite size pieces of broccoli. Sour Cream-You can substitute plain Greek yogurt if you wish. Shredded Chicken-I like to use shredded rotisserie chicken, but any leftover shredded chicken will work. You can even use leftover turkey if you need to use up Thanksgiving leftovers. Shredded Cheddar Cheese-If you want to lighten up the recipe, you can use reduced fat cheddar cheese. 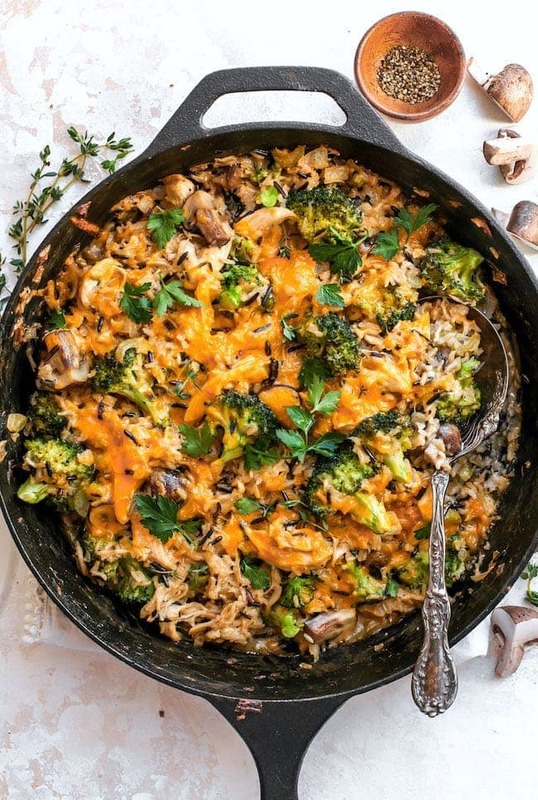 This homemade casserole is super filling because it has so many delicious ingredients in one pan: rice, chicken, broccoli, mushrooms, and cheese! Here are some tips for making the best chicken broccoli rice casserole, I promise it is easy! Melt the butter in a large ovenproof skillet and add the garlic, onion, mushrooms, and celery. Cook until tender. Add the thyme. Whisk in the flour until lightly browned.? Whisk in the dry white wine and chicken broth, cook, whisking constantly, until slightly thickened. Stir in the broccoli, sour cream, chicken, 1/2 cup of cheese, and the cooked rice. Top with remaining cheese. Transfer the skillet to the oven and bake until bubbly, about 20 minutes. Garnish with parsley, if desired, and serve warm. This recipe is from Damn Delicious Meal Prep by Chungah Ree and I love that all of the recipes are perfect for meal prepping. There are so many healthy recipes to choose from that can be made in advance, for breakfast, lunch, and dinner! 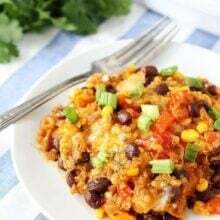 This chicken and rice casserole can be made in advance and put in the freezer. 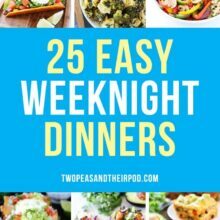 I always love having a freezer meal on hand for an easy weeknight dinner or for sharing with a family who needs a home cooked meal. To freeze the chicken broccoli rice casserole, put the unbaked casserole mixture in a ziplock freezer bag and lay the bag flat in the freezer. Freeze for up to 3 months. When ready to serve, remove the freezer and thaw overnight in the refrigerator. To cook, transfer to an ovenproof skillet or baking pan and sprinkle with the remaining cheese and bake for 20 to 30 minutes or until heated through. Cook the rice mix according to package instructions; set aside. Melt the butter in a large ovenproof skillet over medium-high heat. Add the garlic, onion, mushrooms, and celery and cook, stirring occasionally, until tender, 3 to 4 minutes. Stir in the thyme and cook until fragrant, about 1 minute. Whisk in the flour until lightly browned, about 1 minute. Gradually whisk in the wine and chicken broth. Cook, whisking constantly, until slightly thickened, 2 to 3 minutes; season with salt and pepper to taste. Stir in the broccoli, sour cream, chicken, 1/2 cup of the cheese, and the rice. If you want to freeze the casserole, you can stop here and skip to step 7. Otherwise, sprinkle with the remaining 1/2 cup cheese. Transfer the skillet to the oven and bake until the casserole is bubbly and heated through, 20 to 22 minutes. Serve immediately, garnish with parsley, if desired. To freeze, transfer the unbaked casserole mixture to a ziplock freezer bag and lay the bag flat in the freezer. Freeze for up to 3 months. When ready to serve, thaw overnight in the refrigerator. To cook, transfer to an ovenproof skillet or baking pan, sprinkle with 1/2 cup cheddar cheese, and bake at 375 degrees F for 20 to 30 minutes, or until heated through. *If you don't have white wine, you can use all chicken broth. * Recipe from Damn Delicious Meal Prep by Chungah Rhee. This looks and sounds great! I love how simple it is; it would be an ideal meal! My husband and I loved this casserole.. definitely will make it again! Yay! Happy to hear you enjoyed it! This sounds so good! I love that flavor combo and I love that you used Wild Rice because it won’t get as soggy as normal rice. Made it with vegetarian sausage/veggie broth instead of chicken. Might not make it again soon, just because it was kind of sloppy looking, but honestly it’s a good dish for a non-picky crowd – thanks for sharing.